You start to feel the weather getting a bit warmer, the suns starting to shine brighter and you start seeing the sunglasses coming out. 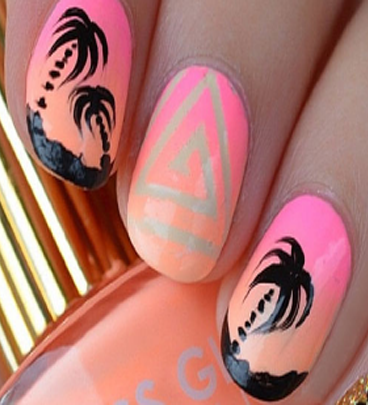 That’s when you know, schools out and summers in, so welcome it with open arms and make sure to match the occasion with some beautiful summer nail designs we’ve picked out for you. With summer coming along the suns out and bound to illuminate and light everything up. 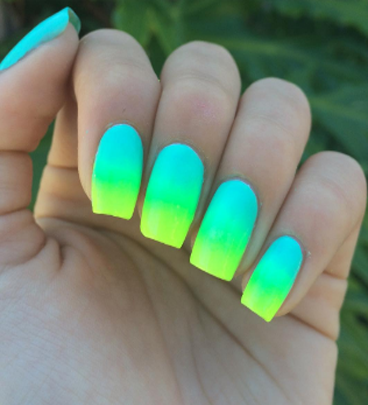 So light up with the sun and go for a wild, bright coloured nail colour design. Summer time is the perfect time to be sipping on some refreshing orange juice. So why not sip your orange juice with some snazzy orange nails. Did you know watermelon is actually 91% water? 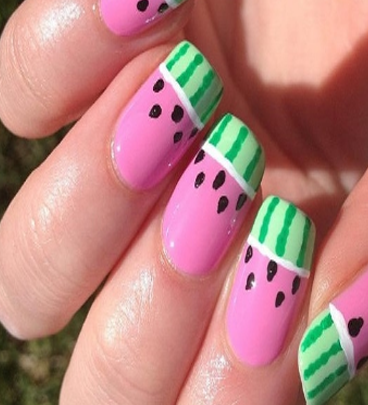 So actually eating watermelon is more like drinking it, and you can do either or with some cute as watermelon nail designs. 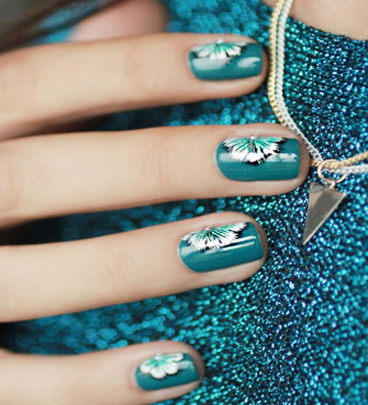 Go for a beautiful blue based nail colour and add some patterns like flowers seen above to really bring your nails to life. 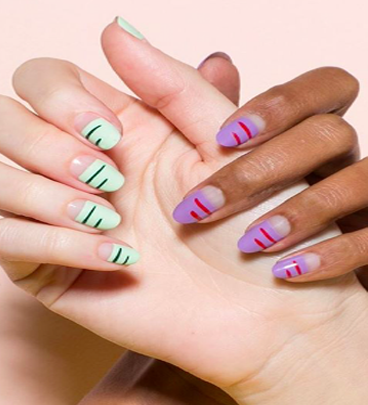 Go for some incredibly cute nail designs by just adding just a couple of dashes or lines to a solid coloured base and you could transform and up your nail game many times. Step up your nail game and go to the next level by not just adding some dashes or lines but go completely crazy on creativity with your nail designs and add complex patterns and shapes to really fish in those compliments. 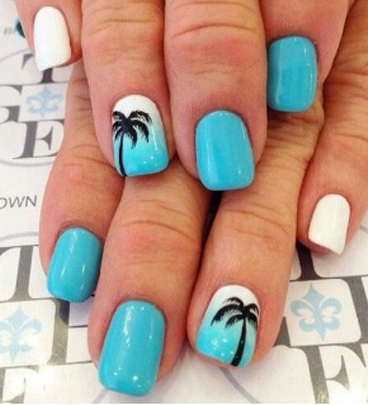 Get the beach vibe going by having cute palm trees painted onto a blue based nail. The blue and white represent the sky so this is perfect for going to the beach on a nice clear sky day. Summers out and it’s time to try out new things. Perhaps hit the beach and go snorkeling or diving or just have a chill time at the beach. 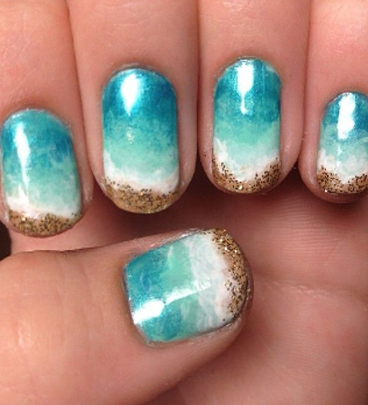 Nevertheless, these beach inspired nail designs are a must to go with your adventures. Have a bit of fun with yourself and let your creativity run wild. Get some bright orange colours and some glitter and let your imagination run wild. 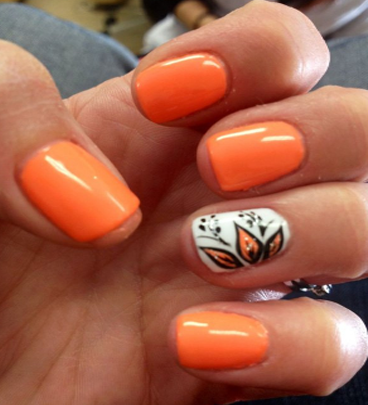 Incorporate some patterns to really bring your nail design to life.